Once again, it can be demonstrated that art can be another way of communicating, examining and humanizing important internal and external human conflicts. It helps the viewer become more informed and more involved than they otherwise would have been, prior to experiencing the art work image and its accompanying story. In Brazil, South America’s biggest and most influential country, with a population of 200 million people (BBC. 2014, May 6); where it is known to be the country of football – art is being used to highlight the daily struggles of its people. Brazil is currently in preparation to host the 2014 FIFA World Cup and the 2016 Summer Olympics in Rio de Janerio. These forthcoming events are attracting huge global interest in Brazil and has given Brazilians an opportunity to have a voice that is being heard worldwide. BBC’s Documentary series helps shed some insight into what it is meant to “Being Brazilian” (BBC. 2014, May 6). One of the ways that Brazilian people are highlighting Brazilian life is through Graffiti Street Art. Street artists in Sao Paulo and Rio de Janeiro are using the streets as canvases within open-air galleries for their graffiti art work as a way to express discontent (The Guardian. 2014, May 24). Brazilian Graffiti Artist Paulo Ito on May 10, posted this mural on the doors of a schoolhouse in Sao Paulo’s Pompeia district. It has become an international sensation, sweeping the Internet after Paulo Ito posted it to his Flickr account. Since then it has been prolifically shared on Facebook and Twitter (McDonald, S. 2014, May 23). 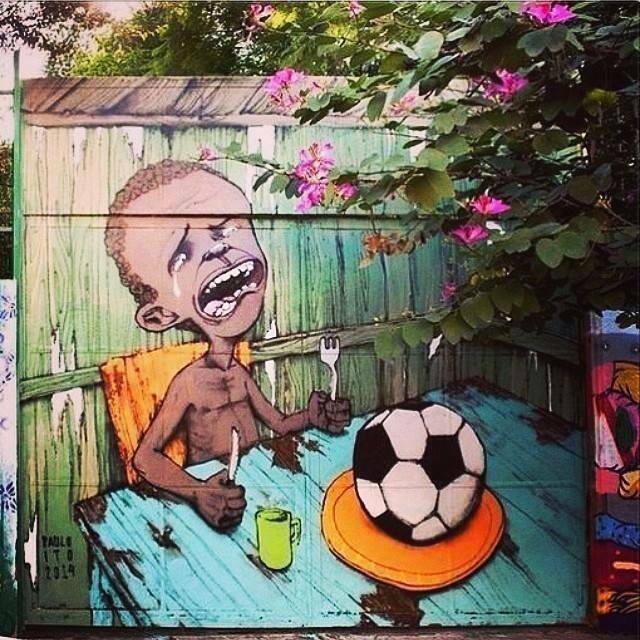 It depicts a “portrait image of a weeping, starving Brazilian child with nothing to eat but a soccer ball” (Stahl. 2014, May 23). Paulo Ito – Graffiti artist in The Guardian’s video “Brazil’s graffiti art in support of World Cup protest” talks about the demonstrations in his country and how worthwhile they are, whilst the world has their eyes on Brazil! This entry was posted in I Do Art Discussions, Other Artists, Paulo Ito - Brazillian Graffiti Street Artist and tagged 2014 FIFA World Cup, 2016 Summer Olympics, Abstract Artist, Being Brazillian, Graffiti, Graffiti Artist, Karen Robinson, Open-air galleries, Paulo Ito by idoartkarenrobinson. Bookmark the permalink.